Documentary Matthew Heineman (CARTEL LAND) returns to our screens with a fictionalised account of the final years of war journalist Marie Colvin - a story told recently in the superb doc UNDER THE WIRE [link]. 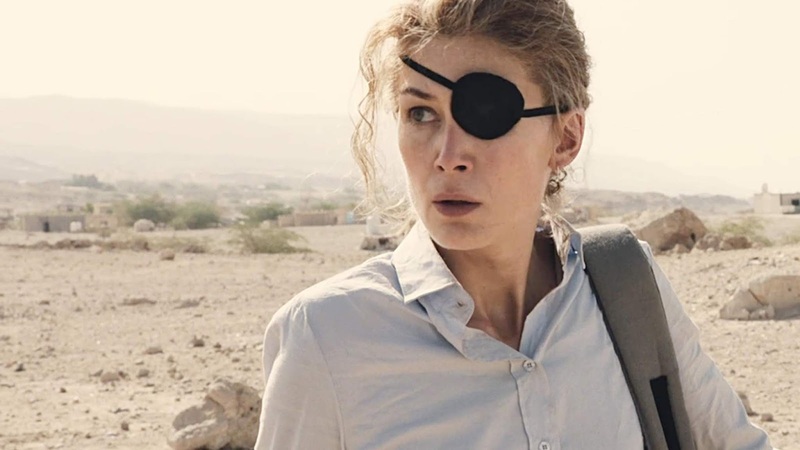 His film opens with Marie in Sri Lanka, covering the civil war, being shot in the eye and acquiring her trademark eye-patch. The movie ends 11 years later, inevitably, with Colvin's death, the victim of a targeted bombing in Homs. In between these two events, we see Marie move between war zones and metropolitan dinner parties, carrying with her her trauma, drinking heavily to forget, blaming her editors for sending her out, daring her colleagues to face their face, or overlook it, to return to the war zone, unable to allow herself to quit. She was truly a superb woman, committed to exposing the impact of war on ordinary people, and her cussedness and intelligence one her the access to figures such as Gaddafi, and the respect of her peers and readers. But questions must be asked about the risks she took, whether it was worth it, and the men she led in her wake, not least her photographer Paul Conroy. There's also some tough questions to be asked about why Marie, of all the dead war reporters, gets docs and films. Because she was so good? Yes, maybe. But maybe also because she was the iconic woman with the eyepatch? This fictionalised account is well-enough made, with Rosamund Pike doing a superb impression of Colvin. A gritty script doesn't shy aware from her private fears and trauma, the contradictions in her predicament, and the grim reality of being a war reporter. There's a superb set piece argument with her editor, played by Tom Hollander, that captures the questions at the heart of her story. But I couldn't help but feeling that this version of events didn't add anything to the experience of watching UNDER THE WIRE, and that rather than being mediated by a fictionalised retelling, I'd rather just here this story from Paul, and from old footage of Marie, and from her friends, editors, colleagues. This didn't seem to add any greater insight, and because the direction here is workmanlike, it just didn't seem to add anything. A PRIVATE WAR is rated R and has a running time of 100 minutes. The film played Toronto and London 2018 and was released last year in the USA. It will be released in the UK on February 15th 2019.